When choosing a law school, your decision is most certainly based on the prestige of the faculty, the academic qualifications of the student body, and the institution’s success in placing graduates in satisfying careers. But what about the big money unknowns—the salary you’re likely to earn upon graduation and how much of your rookie attorney paycheck will go toward paying for your education? To help take some of the guesswork out of your legal education strategy, we analyzed more than 60,000 student loan refinancing applications submitted to us from January 2014 to December 2016 to formulate SoFi’s Return on Education (ROED) Law School Rankings. After taking a long, hard look at the average salary and student debt load of law school graduates three years out of school, we compiled objective data that can’t be found anywhere else—verified income and debt, not just reported figures. The result: Rankings of how the top (and bottom) JD programs stack up when it comes to how your financial future will fare. Below, we reveal which law schools produce grads with the highest salaries and boast the best salary-to-debt ratio, as well as the schools where students come out losing the battle between salary and debt. While a law school education can have a positive impact on your lifetime earnings, the high cost of tuition and steep interest rates on graduate student loans mean that the ROED can vary significantly by school. Graduates of the top three schools on our Highest Salaries list—Columbia University, Cornell University, and New York University—can earn starting salaries above $175K, just one or two raises away from the Bureau of Labor Statistics’ best-paid lawyer salary of $187,200. Those top schools all have New York state addresses, reinforcing the notion that location matters when it comes to earning potential. Aside from the location, those high paychecks for law school grads can also be attributed to the job placement rates (90% and above) at top schools, bolstered by a focus on rigorous legal training, the development of interpersonal skills, and access to networking. Experiential opportunities, such as Vanderbilt University’s judicial clerkship program, matter a lot, too. There, students at our No. 19 school vie for competitive slots at all levels of the federal and state court systems. And their chances of getting those clerkships are good. Stats from the ABA indicate that between 2011 and 2015, Vanderbilt’s law program was ranked in the top 11 for judicial clerkships after graduation. Brigham Young University is a surprise list topper when it comes to offering the top salary-to-debt ratio (a whopping 1.7). Although this school only ranks No. 38 on the U.S. News and World Report’s Best Law Schools list, it offers tremendous value—especially for members of the Church of Jesus Christ of Latter Day Saints, who pay a tuition of just under $12,000 per year (non-LDS members pay that much per semester). That’s one of the reasons the average student loan debt among Brigham Young graduates is less than $65,000. Half of graduates stay in Utah to practice law, however, which likely accounts for the lower salaries its graduates command after graduating. Yale University, which holds the No. 1 spot in the U.S. News rankings, is our third-best value for your money when you take student loan debt and earnings potential into account. 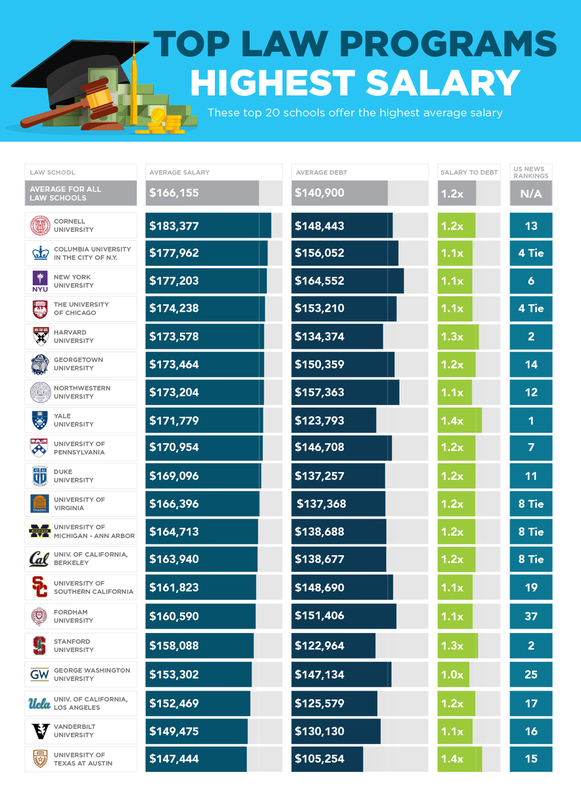 Yale graduates are among our top 10 salary earners, averaging $171,779 a year. The Ivy League school offers generous financial aid packages that include significant need-based scholarship grants. In fact, more than half (60%) of Yale students qualify for these grants. If you live in Texas, you’ll want to consider the University of Texas at Austin (our No. 2 with a salary-to-debt ratio of 1.4). The state school ranks a respectable No. 15 on U.S. News and World Report’s Best Law Schools. Tuition for in-state students is just under $34,000 a year, the second lowest in-state tuition among U.S. News’ top 20 law schools. 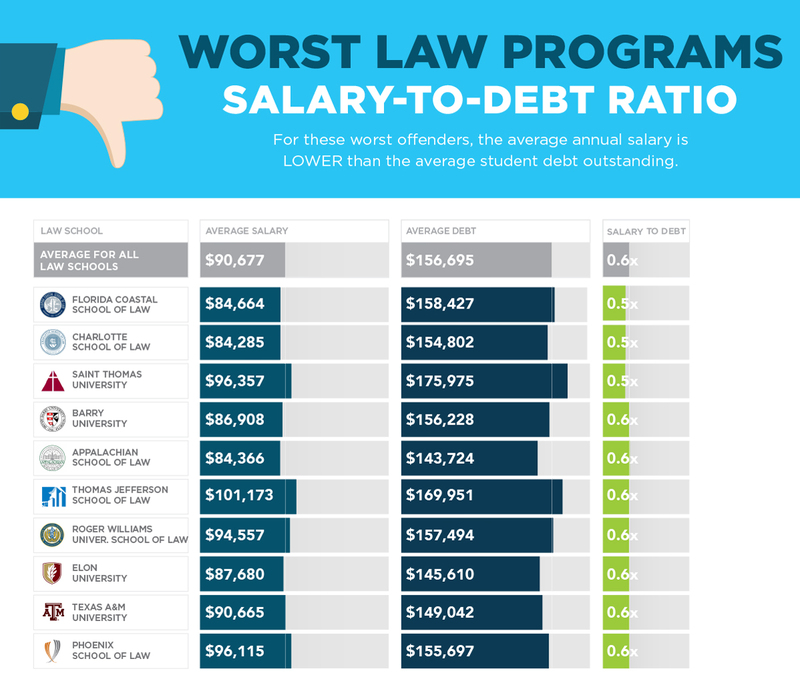 You’ll want to steer clear of the law school programs on our list with a 0.6 or lower salary-to-debt ratio. That means graduates of these programs are burdened with approximately 1.5 times more debt than their annual salary. Florida Coastal School of Law, which ranks dead last on SoFi’s list, accepts 72% of its applicants, including those with some of the lowest LSAT scores—below 148. Despite very large class sizes and a high student-to-faculty ratio, the school charges $44,000 a year in tuition, which is comparable to costs at some of the top 20 law schools. Graduates of Florida Coastal School of Law carry an average of nearly $160,000 in student loan debt and typically earn under $85,000 annually. In 2014, less than a quarter of graduates were employed upon graduation from Texas A&M University. Those who did find a job in the private sector earned just $60,000 a year, compared to the national average of $106,000 earned by lawyers working at private firms. The school ranks No. 111 in U.S. News and World Report’s Best Law Schools, and is at the bottom of our list of schools that offer a good value. Small schools, such as the Appalachian School of Law in Virginia, which hasn’t been around as long as other law schools and is experiencing an ever-shrinking admitting class, is among the worst law school programs on our list. Graduates of Appalachian earn $84,000 on average, but shoulder nearly $145,000 in student loans. Law school is a huge investment of both time and money. And because there’s a good chance that a large portion of your paycheck in the years immediately following graduation will go toward paying down student loans, it’s important to choose a school that will help you earn a premium salary. SoFi thinks you and your law school peers should focus more on making partner than making loan payments. Discover how refinancing your student loans can lower your student debt and put you on a strong financial path to help you succeed. SoFi partners with over 650 top companies, including 62 of the Vault Law 100 firms, to offer student loan refinancing and contributions to their employees. Check with your employer to see if SoFi is a partner to take advantage of even greater savings. Great post! Will you share the complete rankings of salary to debt ratio? This is horrendously misleading and an awful article. I do not know where SoFi is getting it’s data, but it must be incorrect. Suggesting that students will earn, on average, more than $150,000 out of law school is just incorrect. Even if this data only reflected students with law firm jobs (which is less than half of students), it would be incorrect. SoFi must be ignoring all students who moved into public service (likely because they are not refinancing their loans due to public service loan forgiveness), went on to clerk for federal judges (generally more prestigious than law firm work), or did not get law jobs at all (last estimate, over 20% of graduates), all of whom, on average, earn around $50,000/yr. I may start using this article in my college class as an example of selection bias. We are looking at only high earners with good credit scores, and thus the ability to refinance their loans using SoFi’s services. I am honestly insulted and frustrated by this article. Full disclosure, I have refinanced my loans with SoFi. I am a law graduate with what is considered a good industry job making in the range of $80k per year. Amongst my peers, I am considered relatively successful and I graduated from a school that was in the top of SoFi’s rankings. I have worked with career services at that school, and I know that number is incorrect for that school. SoFi, please be more responsible about the data you publish. Also excluded from the sample are individuals who do not graduate with loans: parent-funded or scholarship. It would be interesting to get a sense of what percentage of the student body are represented by the SoFi data per school. Are the complete results available? This is a great report, but would love to see the complete list. Is a complete rundown of all ABA accredited law schools available? The top row in each of your tables is apparently mislabeled. It says, “average for all law schools,” but in fact the average seems to be for only the ten or so schools on the table. For example, in your second table (top law programs for salary to debt ratio), the average shown is 1.4. Yet, among the top ten schools shown in this list, only one of them is above average, and six are above average. In a list of the top ten schools on this metric (out of roughly 200), all of them should be above average on his metric. 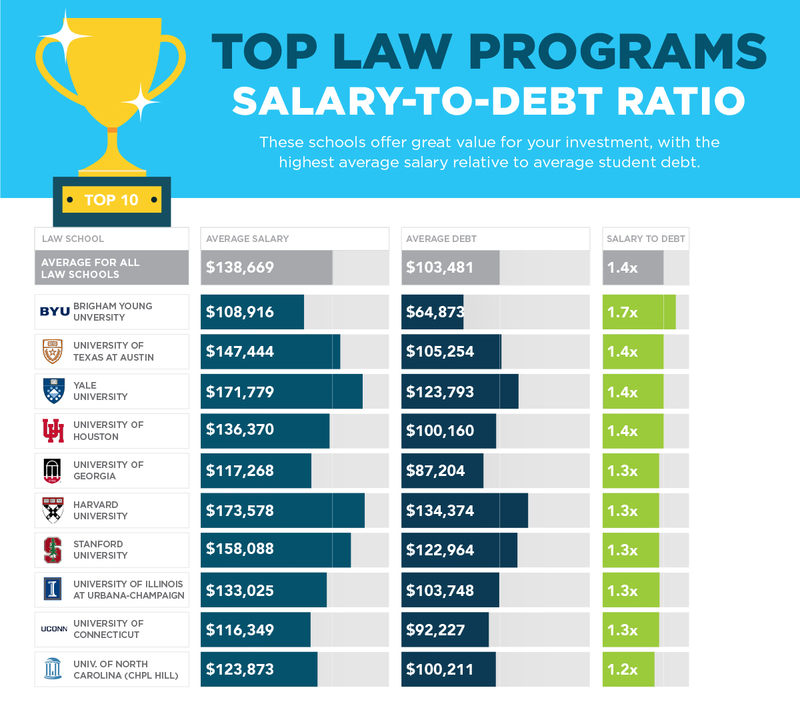 This problem is also apparent because your second and third tables both show the same metric (salary to debt ratio) and thus should have the same “average for all law schools.” But instead the average changes between the two tables. Also, can we get the full list of all schools on these metrics? Most students are making more regional decisions (e.g., U Colorado v. Denver U). Thanks so much for publishing this really neat study. Just wondering, is there a complete list available? The lowest average salary for a lawyer listed above is from Florida Costal? I went to a T-2 school and am underemployed. I would kill to get a salary at that rate of pay. Where do these salary numbers come from? I know many unemployed and underemployed attorneys who believe $65K is the golden ring….. These salary ranges seem highly inflated…..ALTERNATIVE FACTS? WTF?